William Hill Poker is a member of the iPoker network of poker sites, overall considered to be the 3rd largest poker network online. William Hill Poker has a new welcome bonus for all new players. You can now receive £10 immediately in poker credits, plus up to a £100 bonus with a minimum transfer of £10 into your new poker account! The £10 in poker credits is awarded int the form of a £7 cash game ticket, two SNG Ladder tickets worth £1, one Twister SnG ticket worth £1, and one Wild Twister SnG ticker worth another £1 for a total of £10 in poker tickets! Then receive up to a £100 poker bonus, which is awarded by earning WH Points. Download William Hill Poker here. Alternatively, William Hill Poker also offers a generous 200% deposit bonus of up to £1200/$2000/€1500. You are required to deposit £600 or $1,000 or €750 to qualify for the maximum 200% matching bonus of £1200 or $2,000 or €1500. The bonus money is then given to players based on WH Points achieved while participating in the real-money cash games and tournaments and SnG’s at WilliamHill.com. Players accumulate WH Points based on the rake they contribute to each of hand of poker. WHPoints can also be earned when tourney fees are paid by the player. You must be part of the hand in the ring game (by calling the hand, etc) or buy in to a tournament to achieve any WH points. The amount of rake taken at ring games or the buy-in of the poker tournaments or Sit-n-Go’s established the amount of WH Points given to players. You need to achieve 425 William Hill player points to be awarded a $5 bonus. 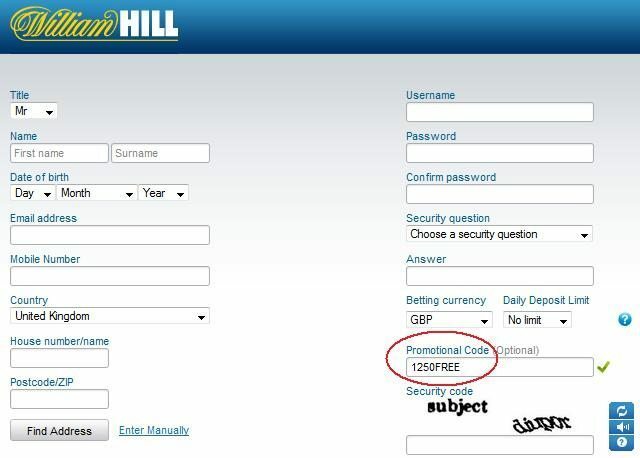 Since WilliamHill.com explains its bonus in $USD, we’ll stick with that currency for our examples. The William Hill bonus is paid out in $5 increments, up to the upper limit of $2,000. So you can earn 400 individual payments of $5 each, therefore you would have to achieve a total 170,000 William Hill points to earn the complete $2,000 or £1200 bonus. You have 60 days to cash out as much of the bonus as possible. Or all of it. It’s all up to you! So exactly how are the points earned? With regards to cash games, William Hill points are distributed according to the Rake Range at a particular ring game and the WHPoints chart becomes much more convoluted. 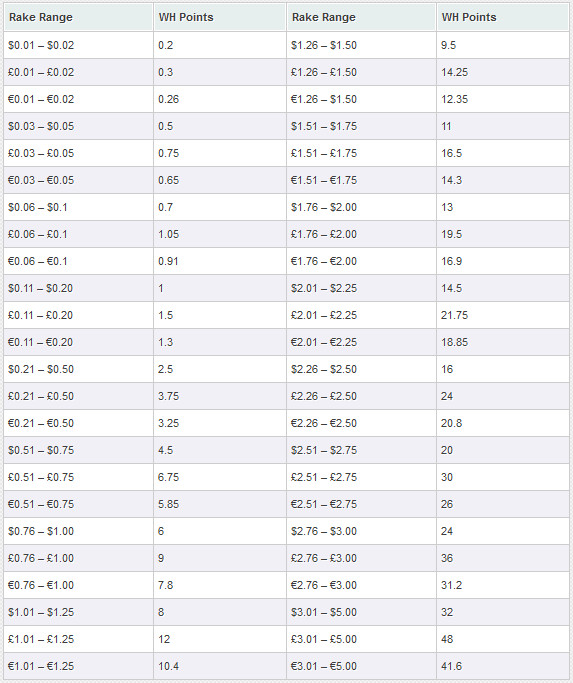 As you can see, you earn 1.5 WHPoints if the rake is £0.20, 9 points if the rake is £1.00, and 36 points if the rake is £3.00. It’s difficult to estimate the number of hours required to earn the £1200 bonus because of so many factors such as the stakes you play, the number of players at the table, the average pot sizes, etc. Using a simple scenario of playing the £200 No Limit Holdem games, with £1-£2 blinds and assuming a 10 player table, we can generally say the average pot size will be £20.00 with an average rake amount of £1.00. The player earns 9 WH points for participating in the hand with a £1.00 rake. Typical online poker players usually play at a rate of 70 hands/hour, so you could possibly collect around 630 WH Points per hour at these stakes. Achieving the mandatory 170,000 William Hill poker points to receive the full £1200 bonus would require about 270 hours of playing poker! Now if you play 4 tables simultaneously, this time gets reduced to 67.5 hours and William Hill allows you to play up to 16 tables at once. William Hill Poker allows you 60 days to earn as much of the bonus as you can, which is plenty of time to take the full £1200. When compared to other online poker welcome bonuses, Will Hill Poker bonus is an easier and more lucrative offer. At William Hill, you have to spend $2.83 in tournament fees to earn 85 WH Points, equating to $1 in bonus money. If you were playing poker at PokerStars or Party Poker, you would have to spend $3.00 in tournaments fees to earn the same $1 in bonus money, making these bonuses MORE DIFFICULT than William Hill’s. The new player bonus at William Hill is a better bonus! William Hill Poker provides additional benefits to players such new depositor freerolls, cash bonuses earned via their VIP club, and other seasonal awards. Click here to download William Hill Poker and start earning your poker bonus!